Compared to recent summers, the monarch butterfly activity in central Iowa seemed to be heavier than in recent years. Many observers reported seeing heavy activity in parts of central Iowa, and in our butterfly garden in Altoona, the monarch visits were much greater than in years past. The sightings are anecdotal in nature, but they hold the promise of good things to come this fall. August 26--Ten monarchs were observed during a late-morning visit to the Neal Smith National Wildlife Refuge near Prairie City, Iowa. Staffers at the refuge are seeking to restore the area that was once part of the nation's tallgrass prairie. The monarchs, other butterflies, and other wildlife can find a haven in the refuge--established by the U.S. Congress providing for acquisition of 8,600 acres. August 31--Five days later, another visit to the Neal Smith wildlife refuge turned up hundreds of monarch butterflies passing through the area. In one half-mile stretch along a roadway, approximately 400 to 500 monarchs were observed for several hours feeding from tickseed sunflowers and occasional thistles. The wind was blowing 10 to 20 miles per hour, and wind gusts would send the monarchs soaring off the flowers and into the air--a wonderful sight to behold. The large number of monarchs in the area tended to confirm reports of earlier heavy migrations in northern Iowa and Minnesota appearing on the national Journey South Web watch. September 1--Arrived at the Neal Smith wildlife refuge at 9 a.m., and I observed plenty of monarch butterflies from the time I entered the refuge. The tickseed sunflowers appear to be the main attraction for the monarchs, and the flowers are growing in large areas along the roadway leading through the refuge. Thistles, Queen Anne's Lace, Indian cup, Maximilian's sunflowers, goldenrod, compass plant, and Jerusalem artichoke also are helping to attract the monarchs. In the morning, monarchs were constantly observed flying over and off several acres of big bluestem grass, and it appeared is if they were coming up out of the grass--perhaps having spent the overnight there. By mid-morning, the total of monarchs observed was easily more than 200. They arrived to feed once again on the tickseed sunflowers and thistles. Up a hillside, they could be seen swirling into the air and flying here and there as the wind gusted from time to time. On a second visit in the late afternoon, at least 200 monarchs were seen feeding throughout the area. September 2--During a morning visit, more than 200 monarchs were observed flying to and fro through the Neal Smith wildlife refuge. They were feeding on the flowers, primarily the tickseed sunflowers and thistles. It's interesting to note that in areas where goldenrod grows--but the other afore-mentioned flowers do not--the monarchs will feed on the goldenrod. But at this refuge, the stands of goldenrod appear to be ignored when the monarchs have a choice of other flowers--especially the tickseed sunflowers. Back home in our butterfly garden in Altoona, Iowa, 10 or more monarchs were observed on this day flying in and out of the garden and feeding on the flowers--with the primary favorite here being the prairie (purple) coneflowers. The native purple asters--a primary attraction for the monarchs--have yet to bloom. September 3--Another great day for monarch watching. The highlight came late in the afternoon--from 4:15 p.m. to 5:15 p.m.--when 302 migrating monarchs were counted in the air during the single hour. The wind was blowing from the northeast, and the monarchs were essentially riding the wind--especially when they were flying or floating at 1,000 feet or above. The counting was done near our butterfly garden in Altoona, Iowa. The garden is just a few blocks from the open prairie to the north, and the monarchs appeared as singles and in groups of two or three as they flew over at heights from 5 feet to more than 1,000 feet. Later, at least 30 monarchs were feeding at various places in our butterfly garden. A return visit to the Neal Smith National Wildlife Refuge earlier in the day turned up substantial monarch activity, but the overall numbers appeared to be down from the three previous days. September 4--Approximately 25 to 30 monarchs were flying in and around our butterfly garden after 5 p.m. They were feeding on the flowers and resting on the branches of oak and apple trees. Some of them would be roosting there for the night. 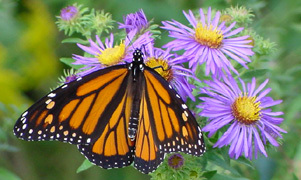 In past years, the major days of the monarch migration usually have coincided with the blooming of the native purple asters in the butterfly garden. The asters grow from 4 feet to 6 feet in height and, when blooming, are a major attraction for the monarchs. This year, the asters have yet to begin blooming although they will any day now. Meantime, the prairie coneflowers and phlox have been providing nectar for the monarchs. September 5--Migrating monarchs were active along and across the roadways in the Des Moines area. In our butterfly garden in the late afternoon, 10 to 15 monarchs were spotted in and around the garden. How do the current monarch migration patterns compare with previous years? Some comparisons can be drawn by looking at field reports on the central Iowa migrations in 1997, 1998, 1999, and 2000. September 6--Stormy weather with tornadic activity passed through central Iowa in the late afternoon. Significant proprerty damage was reported in West Des Moines, Iowa, and other areas of central Iowa were buffeted by strong winds and heavy rains. But the sun came out again in the late afternoon, and by early evening, at least 15 monarch butterflies could be seen flying around in our butterfly garden and getting ready to roost in the trees. The migratory journey to Mexico is a long one, and given the volatility of the weather during some autumn days, one has to admire ever more the ability of the monarchs to make and to survive the journey. One weekend a number of years ago in eastern Iowa, major tornadoes occurred on a Saturday, and on Sunday afternoon, I observed the most monarchs in the air that I have ever seen over central Iowa. Thousands upon thousands of them were flying quickly to the east southeast over Altoona, Iowa, and I always thought their journey had been redirected by the tornadoes the day before in the eastern part of the state. The monarch butterfly migration update for September 6 on the national Journey North/Journey South Web site provided an overview of the migration with a headline "Migration Through Midwest Peaks in Iowa," and it noted this migration journal. See the report for excellent perspectives on "The Historic Importance of the Prairie Ecosystem to Monarchs" and "A Field Trip to the Prairie with Dr. Lincoln Brower." September 7--Heavy rains and strong winds continued across central Iowa and much of the state for most of the day, appearing to diminish any extensive movement of monarchs. In our butterfly garden in mid-afternoon, 10 to 15 monarchs were observed resting in the trees and occasionally flying out to feed on the flowers. Heavy rains continued into the night, and the weather forecast for Saturday predicted more rain. Once again on Friday, major damages from strong winds were reported in central Iowa. At week's end, nature offered a promising sign of its continuity: The first native prairie asters were found blooming in the butterfly garden! The purple flowers with their golden centers are another indicator autumn is coming on the land. September 8--This Saturday was an extraordinary day. Early in the morning before the sun rose, heavy rain continued to fall, but as the day dawned, the clouds began to break up, and several monarchs came out of hiding in the butterfly garden in Altoona. A late-morning visit to Chichaqua Bottoms wildlife area in northeast Polk County turned out to be highly productive for monarch watching. After several days of being slowed in their journey by the heavy rain and strong winds, the monarchs suddenly were on the move again. First arrival at Chichaqua gave no signs on the ground that anything was different in the monarch movements, but eyes to the sky told another story. Between 10:50 a.m. and 11:50 a.m., 923 monarchs were counted in the sky heading south--many with the naked eye but others with binoculars. At several points, the monarchs came over so fast there's no doubt the "count" was conservative in relation to the many butterflies moving overhead. Often, they could best be seen when their flights were against an ever-changing cloudy background, but as the sky cleared, they were more difficult to see against the crystal blue sky. A look at the Iowa map hinted at their possible story. On Friday afternoon, some of the heaviest wind damage and rain occurred in the community of Nevada and surrounding areas to the north. The monarchs must have been waiting for the all-clear weather before they moved on to the south over Iowa. And move they did--racing at 500 to 1,000 feet in groups of 10 to 15 and as singles, doubles, and triples. Nine-hundred of the monarchs were counted in the first 40 minutes, and then the flurry seemed to slow. What a sight! Later, on the roadways in Polk, Marshall, and Jasper Counties in central Iowa, hundreds of monarchs were observed as singles and in pairs moving across the land. September 9--Rain again in the morning slowed the movement of any monarchs. A visit to Chichaqua Bottoms wildlife area at mid-day indicated how timing can make a difference. After yesterday's fantastic sightings at Chichaqua, only a single, high-flying monarch was observed this Sunday. Later in the day as the sky cleared, seven monarchs--all singles--were seen high in the sky heading south over Altoona, Iowa. Perhaps 5 to 10 monarchs continued to stay around our butterfly garden. September 10--A late-afternoon visit to the Neal Smith National Wildlife Refuge turned up approximately 100 migrating monarchs feeding in one area. Unlike previous times this fall, when monarchs stopping at the refuge were observed feeding primarily off the tickseed sunflowers, this time the monarchs were favoring the goldenrod. They were in a stand of goldenrod stretching over perhaps 100 yards in a small valley along a park roadside. The observation time was 4:30 p.m. to 5:30 p.m. The afternooon sun was warm, and the wind was blowing lightly as the monarchs flew gently from flower to flower. Later, near dusk, 10 monarchs were seen roosting on the branches of a pin oak tree in our butterfly garden. September 11--A day of national tragedy as the twin towers of the World Trade Center in New York and the Pentagon in Washington were attacked. September 12--Several monarchs were observed at the end of the afternoon in our butterfly garden. They likely were representing the last phases of the migration through central Iowa. September 13--Two monarchs were noted on the Drake University campus at midday. An early afternoon rain slowed the monarch movement for a while. But then came one of nature's surprises. I went outside to get the mail when I arrived at home in Altoona, and I immediately saw five or six monarchs swirling around a walnut tree in the front of our butterfly garden. A look to the sky showed a wonderful picture. The monarchs were moving again in heavy numbers--this time to the west, flying at heights of 25 feet to more than 1,000 feet and riding a wind from the east. Between 5:30 p.m. and 6:15 p.m., 223 monarchs were counted with the naked eye and binoculars. Many could be seen easily against an ever-changing cloudy sky. Having thought that most of the migration had now passed through central Iowa, I was wondering how many more days might bring larger numbers of monarchs. It was a beauty to behold and another reminder that the natural world is full of surprises. September 14--For the second consecutive day, large numbers of migrating monarchs could be seen in central Iowa. When I arrived home in the early afternoon on Friday, monarchs were swirling around the walnut and oak trees in areas adjoining our butterfly garden. A look at the sky showed monarch movement similar to the previous day--mostly from east to west as the butterflies took advantage of the wind that continued to blow from the east for another day. On a day when I had seen the national day of remembrance gathering on television at midday from the National Cathedral in Washington, D.C., the sight of many monarchs in the sky seemed to be nature's special message for those who would see the flight. From 1:15 p.m. to 2:15 p.m., I counted 248 monarchs. I then watched more television coverage of the national tragedy concerning the terrorists' attacks in New York City and Washington, D.C. Returning to nature, I counted 76 more monarchs between 4 p.m. and 4:30 p.m. The temperature at the time was 59 degrees, and the wind was blowing from the east. Later, as dusk settled in, monarchs were observed preparing to roost on walnut, oak, and maple trees in the area. September 15--Heavy monarch activity across central Iowa on this Saturday seemed to suggest the major migration was continuing--or perhaps a second wave was occurring. The heavy numbers being spotted over a longer period of days hold out hopes that, in fact, the overall monarch migration is larger this year than it has been in several years past. Late Saturday morning, I went first to Chichaqua Bottoms wildlife area in northeast Polk County, where I saw a few monarchs flying high on their way south. I moved on to Neal Smith National Wildlife Refuge and stationed myself at the first entry stop at the north end of the refuge. I did so because as I drove from one wildlife area to the other, I began to see numerous monarchs moving across the prairie and the roadways. In a 30-minute count between 11:55 a.m. and 12:25 p.m., I counted 193 monarchs passing by at heights from 5 feet to more than 1,500 feet in some cases. On a second 15-minute count after waiting for 20 minutes to observe the general surroundings, I counted 59 more monarchs from 12:45 p.m. to 1 p.m. In a drive throughout the refuge, I continued to see heavy monarch movement, and in a number of areas, I also observed monarchs feeding on the late-season flowers. Returning to my home in Altoona, Iowa, about 15 miles from the Neal Smith refuge, I continued to see heavy monarch activity in the skies. Between 1:30 p.m. and 2 p.m., I counted 202 monarchs flying south over our butterfly garden. They could be spotted coming in from the north; some then passed on high overhead, while others began a downward flight directly into the native asters now blooming in our front garden. Another 30-minute count beginning at 2:05 p.m. and running until 2:35 p.m. showed 121 monarchs. The skies during the day through the area were generally overcast to clearing, depending on the time of the day. As evening neared, one could see the wonderful sight of 25 to 50 monarchs swirling in the air over our butterfly garden and seeking an overnight roosting area in trees throughout the neighborhood. A neighbor counted 12 monarchs on his white butterfly bush and came to tell me so. In all, the specific counts and the many other monarchs observed led me to estimate I had seen more than 1,000 monarchs during the day. September 17--The sharp change in the weather diminished the monarch count to four in our butterfly garden. 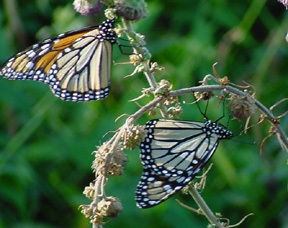 A rain and cooler days appeared to contribute to the departure of many monarchs for warmer areas. September 18--For the first day, no monarchs were sighted. The cool weather and intermittent rain likely contributed to the situation. But I was reminded of how things change so quickly in the migrating season. A friend told me about his own observations on Saturday morning, September 15, on a day when I had seen large numbers of monarchs in central Iowa. He was playing golf on a course in West Des Moines when he noted what he described as thousands of monarchs roosting in a protected corner of the course around 11 a.m. He said the monarchs were so heavy on the trees in the protected area that it reminded him of photographs he had seen of monarchs in their overwintering site in Mexico. September 19--The overcast sky cleared by afternoon, and five monarchs spent the late afternoon in our butterfly garden. September 20--Family, friends, and students continued to tell me about their observations of monarchs in central Iowa. The sightings often were one or two monarchs at a time, but a substantial number of sightings were reported across the area. At the end of the day, a single monarch spent more than an hour on the purple asters in our butterfly garden. September 21--No monarchs were seen. September 22--One monarch observed along the roadway, and one monarch was in the butterfly garden. September 23--Cooler and rainy weather meant no monarch sightings on this day. September 24--A cold front pushing in from Canada was bringing lower temperatures and a forecast for frost over much of the state of Iowa by evening. September 25--Much cooler weather--down into the high 30s and low 40s Fahrenheit overnight across Iowa--appeared to have halted monarch activity. September 27--A single monarch was observed in our butterfly garden during the late afternoon. It was feeding on the purple asters. September 29--Two monarchs were seen during the day Saturday. September 30--A friend saw several monarchs on Sunday. But the monarch activity clearly has subsided as the month ends.